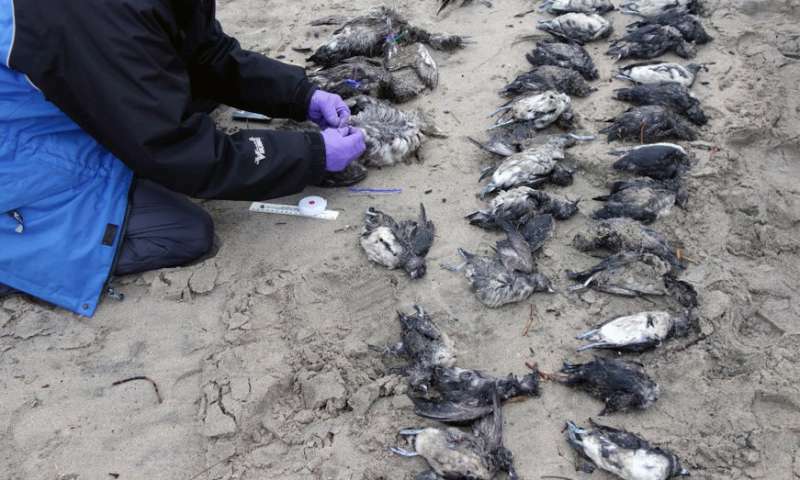 A network of more than 800 citizen scientists responded as the birds, called Cassin's auklets, turned up dead in droves along the coast. Beach walkers and local residents recorded the location and date of carcasses as they found them, entering the information into a real-time database that helped state, tribal and federal wildlife experts track the mass mortality event as it unfolded. The efforts of these place-based data collectors—along with data on temperature, ocean circulation and the abundance of prey—have provided the first definitive answer to what killed the seabirds: starvation, brought on by shifts in ocean conditions linked to a changing climate. An international team of about 20 researchers from federal, state and provincial agencies, universities and wildlife organizations published their conclusions in the April 16 edition of Geophysical Research Letters. 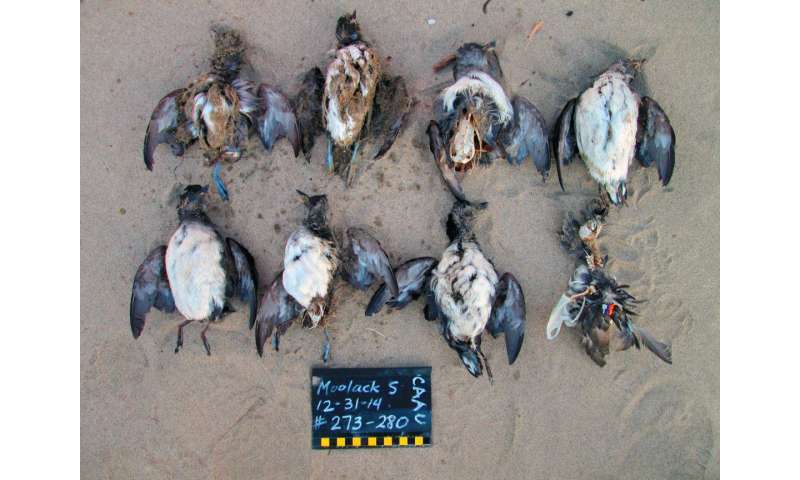 "This paper is super important for the scientific community because it nails the causality of a major die-off, which is rare," said senior author Julia Parrish, professor in the University of Washington's School of Aquatic and Fishery Sciences and executive director of the Coastal Observation and Seabird Survey Team (COASST), one of the citizen science groups that counted the carcasses. "When we see these mass mortality events, that's the ecosystem saying, in big neon letters, that something is wrong. This paper can be used as definitive proof of the impacts of a warming world, and it's a not a pretty picture," Parrish added. The team's paper pinpoints starvation as the cause of death for between 250,000 and 500,000 Cassin's auklets in late 2014 to early 2015. The birds' main source of prey, aquatic zooplankton known as krill and copepods, was found to be smaller and less abundant than in previous years, forcing the seabirds to eat less nutritious "junk food" instead of their usual nutrient- and energy-rich prey. Cassin's auklets are palm-sized, stocky seabirds known for their remarkable ability to fly underwater in search of food. They are a gregarious species that nest in colonies and migrate south along the coast in early fall, after breeding. Warmer surface water temperatures off the Pacific coast—a phenomenon known as "the blob"—first occurred in the fall and winter of 2013, and persisted through 2014 and 2015. This event was the likely culprit for shifting the zooplankton "dinner table" toward less nutritious species, the researchers found. Energy-rich copepods thrive in colder water. When the massive marine heat wave spread along the coast, it swept in loads of smaller, less nutritious copepods typically found in warmer southern waters. Through the summer of 2014, ocean circulation kept the blob at bay in the Pacific Northwest, creating a coastal wedge of cold water full of energy-rich food just off the coast of Oregon and Washington. But that refuge collapsed in mid-September when seasonal shifts in ocean circulation changed. As a result, Cassin's auklets migrating south after breeding off the coast of British Columbia essentially lost their nearshore foraging habitat. "A lot of the evidence points to there being a very tangible link in the warming of the Pacific to changes in ecosystem structure that ultimately led to seabird starvation," said lead author Timothy Jones, a UW postdoctoral researcher in aquatic and fishery sciences. The warm "blob" sat at the surface of the Pacific Ocean for more than three years. 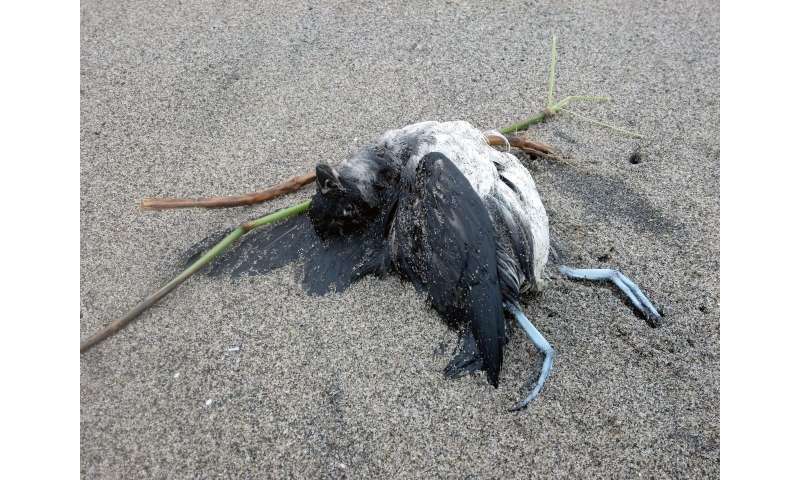 After the auklet die-off, four more mass mortality events involving seabirds took place, occurring farther north each time. Murres, puffins, and most recently short-tailed shearwaters and northern fulmars in the Arctic experienced a similar fate as the auklets—as far north as the Chukchi Sea. "The Cassin's auklets story is really the opener of a saga of multiple seabird die-offs that are unprecedented, as far as we know," Jones said. "This was a unique opportunity to have a window into the future," she said. "We are getting a sense of what the largescale ecosystem—the entire North Pacific up into the Bering and Chukchi seas—might look like in the future, and where we will have winners and losers and how we might see change. In that sense, it was a tremendous natural experiment." The efforts of hundreds of beach walkers—many of whom survey their local beach for seabird deaths each month—combined with databases and the knowledge of scientists across many fields cracked the mystery of the Cassin's auklets with a level of precision that is hard to replicate, the authors said. Critical to their success was the ability to collaborate and share resources. "The big lesson here is you have to work together in the sandbox. No one on this author list has any hope of doing all that work by themselves," Parrish said. "We had incredible luck in that citizen scientists were collecting for years the very data we needed to find the cause."